Researchers have used a scanner designed for rockets to collect the first-ever computed tomography (CT) scan of an entire minke whale. By combining the CT scan results with custom-developed computer simulation tools, the researchers model how the whales hear sounds produced by other whales or by human-created (anthropogenic) sources such as ship propellers. CT, a common tool in in medical diagnostics, uses a special type of x-ray technology to take cross-sectional pictures of an organism or object. 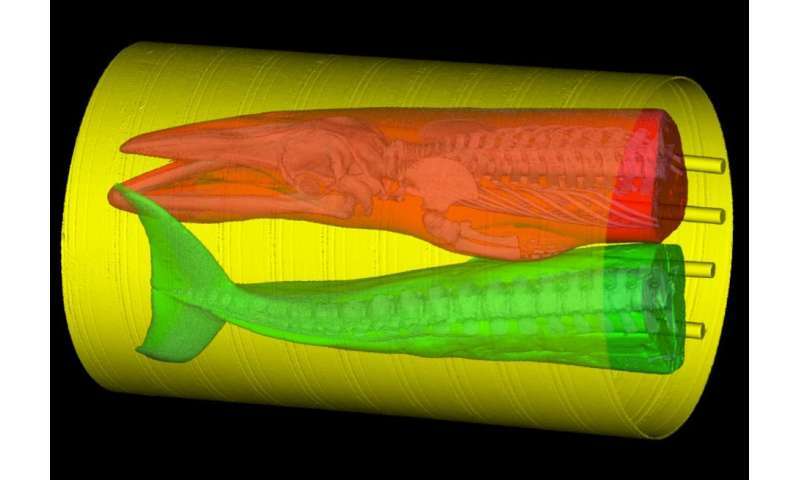 The researchers used a supercomputer to run their simulations, which use a technique known as finite element modeling (FEM) to combine maps of tissue density from the CT scans with measurements of tissue elasticity. "You can imagine that it is nearly impossible to give a hearing test to a whale, one of the largest animals in the world," said lead researcher Ted W. Cranford, PhD, adjunct professor of research in the department of biology at San Diego State University. "The techniques we have developed allow us to simulate the biomechanical processes of sound reception and to estimate the audiogram [hearing curve] of a whale by using the details of anatomic geometry. Scanning an entire minke whale and applying our FEM tools allowed us to predict how well the whale can hear across a range of frequencies." Cranford will present the research at the American Association of Anatomists annual meeting during the 2018 Experimental Biology meeting, held April 21-25 in San Diego. The sensitivity and directional characteristics of the hearing apparatus are important factors for survival in marine vertebrates. Hearing is the most important sensory system for mammals that live in water because sound is relatively easy to produce and can travel long distances in water, making it an extremely efficient means of transmitting information underwater. Cranford's research team is the first to predict audiograms for two types of baleen whales, the fin whale and the minke. Petr Krysl, PhD, professor of structural engineering at the University of California, San Diego, created the computer modeling tools. An audiogram, or hearing curve, describes the sensitivity of an organism's hearing across a range of frequencies. The team also discovered that baleen whale skulls are part of the mechanism for how low-frequency sounds are received and stimulate the ear. In addition, the team's models suggest that minke whales hear low-frequency sound best when it arrives from directly ahead of them. This suggests whales have directional hearing that provides cues about the location of sound sources, such as other whales or oncoming ships. Researchers have long puzzled over whether and how whales might have directional hearing given that the wavelengths of very low-frequency sounds are longer than the whale itself. The results shed light on how minke whales might have evolved to hear important sounds in their surroundings, such as the sounds produced by killer whales, their primary predator. Previous research indicates most of the energy in minke whale pulsed sounds is distributed between 50 and 300 Hertz, with some "boing" sounds ranging between 1-2 kilohertz (1,000-2,000 Hertz). "We assume that minke whales need to be sensitive to these frequencies so that they can hear other minke whales, but not necessarily the frequencies above a few kilohertz," said Cranford. "So it was quite surprising to find that our model predicted sensitivity between 10-40 kilohertz in the minke whale. After double and triple checking these results, we realized that this additional sensitivity at high frequency may indicate some protective awareness of killer whale sounds." The researchers did not find similar sensitivity to high-frequency sounds in the fin whale audiogram. Fin whales are much larger than minke whales and are not commonly preyed upon by killer whales. Adult minke whales are typically about 20-30 feet long. The scan was performed on a 11-foot minke whale calf found stranded alive on a beach in Worcester County, Md. in 2012. After a National Aquarium veterinarian determined that the animal should be euthanized, the remains were transported to a Smithsonian Institution Support Center in Suitland, Md., where the specimen was stored in a freezer. "We requested that they allow us to borrow the specimen and scan it in an industrial CT scanner designed for use on solid-fuel rocket motors," Cranford said. 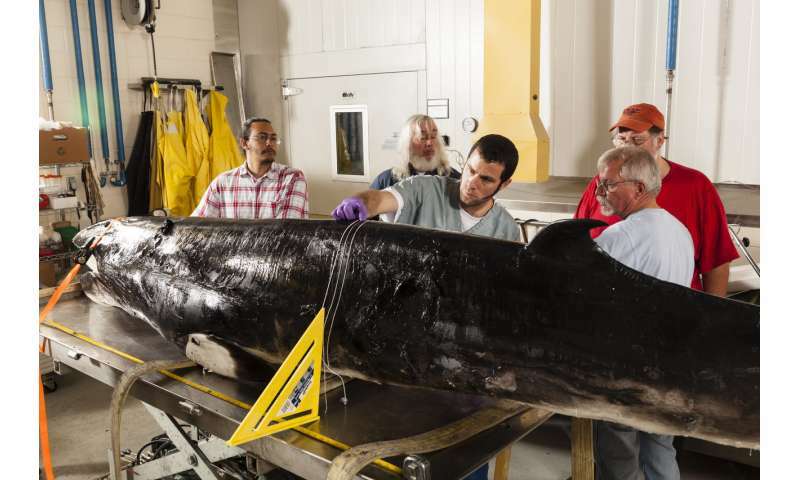 "Scheduling a time to use this specialized equipment is always difficult, and it required more than two years on a waiting list to find some scanning time for the whale." Using scan results as inputs, the simulations revealed how sound waves vibrate along the skull and through the soft tissue of the head. Large baleen whales communicate with one another through low-frequency vocalizations that can travel for thousands of miles. Ship propellers and other human activities can also emit low-frequency sounds, leading to concerns over how these sounds might interfere with and affect the health of threatened species, spurring efforts to regulate marine noise pollution. "By some estimates, the level of low-frequency anthropogenic noise in the world's oceans has doubled every decade for the past five decades," Cranford said. "This noise can produce deleterious impacts on marine organisms and their ecosystem. Understanding how various marine vertebrates receive and process low-frequency sound is crucial for assessing the potential impacts of chronic or acute exposure and the potential effectiveness of mitigation efforts." The team previously used similar research methods to model hearing in fin whales, dolphins and small fish. More information: Ted Cranford will present this research on Monday, April 23, from 11:30 a.m.-noon in Room 11A, San Diego Convention Center ().